Eastern and western ready to wear line. Eastern and western couture line. Eastern and western wedding outfits which cater to the clients requirements. The collection consists of trendy yet traditional dresses. The latest Spring/Summer offering is exclusive and stylish with persain & single alphabet calligraphy done on shirt with peacock broaches. The shoot for this collection is snapped by Zara Tareen, approved by Hira Tareen. 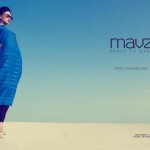 Have a look at Mavz spring summer collection 2012..